make it perfect: .the perfect iced chocolate. mmmm... are you salivating at the sight of that photo? 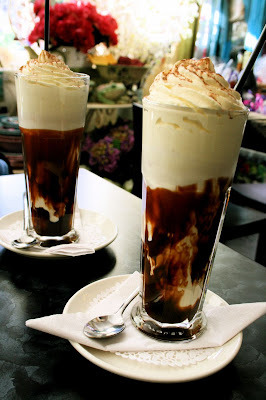 there is nothing better than a good iced chocolate, but it has to be made correctly. NO ice (yuck! ), the cream has to be REAL and freshly whipped, not fake from a can. the top has to be sprinkled with drinking chocolate. chocolate syrup needs to be swirled up the sides of the glass and the ice cream and cream have to just meet so that the ice cream makes the bottom of the cream freeze. thats all. i am sorely disappointed when we go to a cafe/restaurant and i order an iced chocolate and it doesn't meet all of the above requirements. its just not worth the caloreis if its not made properly!! so, what does that have to do with the next photo? blah! as of tomorrow i am going DAIRY FREE for one week! i am bad at sticking to diets or cutting foods, but i'm determined to give it a go this time because we have one mega-cranky, fussy and in pain little boy on our hands. look at that...this is what tommy looks like most of his waking hours and every day he seems to be getting a little worse. he is only sleeping for 15 minute intervals and then wakes up in pain. we are both feeling sleep deprived as he is not getting the big stretches of sleep a newborn baby needs to be content and i usually end up sleeping propped up with tommy lying over my tummy, slightly elevated which makes for an unsettled nights sleep for me too. it is a rude shock as lil was an angellic baby and refused to sleep in our bed and would put herself to sleep from a very early age but with tommy i feel like he is constantly in my arms. who knows if this dairy-free stint will work? i've heard of a lot of breastfeeding mums turn off dairy and then their baby suddenly settles down. i'm hoping that it doesn't because then i can go back to eating what ever i want and we can look for another cause for his grumpiness. just incase it is the cause though, i coaxed mum into coming out for lunch with me today and we drank the most dairy-ed-up drink you can think of...the good old iced chocolate!! kind of like the last supper :) if it is a dairy intolerance then i am dreading the "storm before the calm" after that huge drink kicks in! i'll keep you posted on any developments! in the meantime, if you have any good dairy-free treat ideas (because i am a mega chocaholic and am going to be suffering big-time!) then send them my way! and if the whole dairy-free thing has worked for you before, let me know! I feel for the both of you. If it isn't the dairy that is causing your little man all that pain I hope that it is the next thing on your list that is easily fixed. Dairy would be hard to give up, especially because of the role it plays in chocolate. Sweet William is a dairy free chocolate that is meant to be good and there is a good dairy free icecream that is really yummy (will get back to you with the name. Good luck! oh - poor you - and poor tommy. it must be hard. i hope for your sake that it's not a dairy intolerance as that will make your life difficult. hopefully he just settles down by himself - miraculously! i love the photos of him - i'm a little envious as i love newborns - but i have three of my own and i know in my heart of hearts that three is perfect for me. goodluck. oh - and i would be a pattern tester but i don't think my sewing is up to scratch - yet! Toni, I went dairy free for Darcy when he was about three weeks old. It was the hardest thing (I missed chocolate heaps). But he certainly slept better, was happier and more content. To get more sleep it was worth it, I am just hoping I won’t have to do it for the next one!! Good luck. Hope it all works out for you and Tommy. Isn't just horrible when you see them so unhappy.? Oh poor Tommy and poor you giving up dairy! Aaron has been dairy free for 6 months now and is coping okay. He has oat milk on his cereal and for treats he has the so good vanilla bliss 'icecream' which isn't as good as real icecream, but does the job for now. He also found some yummy dairy free biscuits in coles that are kind of like Tim Tams. They are over $4 a packet though, so he just gets them for treats and has to make them last as they are too expensive! Sweet William is also a dairy free chocolate you can get at the supermarket in the health food aisle. It's okay - better than no chocolate, but Aaron said it tastes like 'cheap chickenfeed chocolate'. I hope you get Tommy sorted out soon. You don't think it's reflux? My boys were shocking with reflux and settled down with 1ml of mylanta every now and then. sorry for your little one. 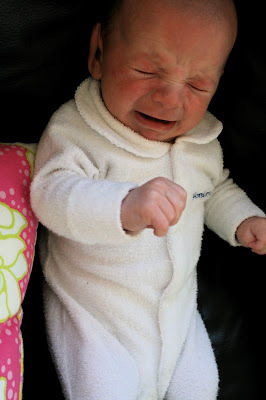 My baby had reflux, the symptoms are similar to what you are discribing. He got a prescription for a medicine that helped a lot. You should talk about it to your pedetrician and have a look on the internet, there are a lot of tips on how to "live better" with reflux babies. Goood luck to you. Hi Toni, good luck. A baby in pain is hard. My daughter was like that after the dream sleeper of my son. I started dairy free and ended up basically narrowing the elimination down to chocolate- which was hard going but after trial and error worked out I was okay with everything but chocolate. She is six now and I don't remember much of how hard that time was, if that's any consolation. Poor little Tommy (and poor you guys, getting by with so little sleep). I hope the solutions becomes clear for you all quickly. Good Luck! my firstborn was a little like that. Going dairy free didn't work (just made me cranky too) but camomile drops worked a treat :) good luck working it out, hope it's a quick process. Toni, I have a friend that has just gone through this whole thing with her 3rd bub also who is now 7 weeks old. In the end she had to bottle feed and couldn't even use soy with her, she had to go to Whey Protein formula, apparently this is the best for fussy tummys. Good luck with remaining dairy free for little Tommy. I guess if dairy is not the problem, perhaps it could also be wheat? As terrifying as that may sound a close family member of mine has just given it up with her little one and it's working wonders for his unsettled behaviour. I'm sure you will work it out though. Best wishes. Our pediatrician recommended eliminating cruciferous vegetables and nuts also from my diet while i was nursing our very fussy little girl. I hope things get better, you are doing great! Oh boy...dairy free is a pip! Hope it makes a big difference. I was dairy free for Mary and it really helped. I must admitt I did sneak the odd spoonful of yogurt and piece of cheese but I sure paid for it with her screaming! :( I feel your pain, good luck. It will be worth it if it works. Oh, and half the amount of dairy intolerant kids also can't tolerate soy so just avoid both! Chiming in quickly from a long way away to say that going dairy-free when I was breastfeeding worked wonders, especially for my first child. He would wake up in pain and was always in very poor spirits after he ate. I stopped eating dairy, and he was like another child. Totally did the trick. It also helped with our second child, whose symptoms were milder, but it helped nonetheless. I will say, too, that going dairy-free did NOT help our third child; he ended up having reflux. So that's a possibility for your Tommy too. Just thought I would add the suggestion to consider oversupply if you are breastfeeding. I had a similar story with DD when she was a newborn, went off dairy, looked into reflux etc but in actual fact I was producing TOO much milk. Who knew! Here's a link if you are interested. It can be such a guessing game can't it! HOw's the dairy free going? Does your little man have reflux maybe? That might explain all the pain the poor little dude is in? Oh Toni - I feel for you!! We're yet to have an easy one. Sam had reflux (they put him on zantac and that pretty much solved the problem - beats sitting up with a baby trying to sleep!). Ella had colic - 9 months of severe sleep deprivation and we never figured out what the cause was. Owen was tongue tied - symtoms can be similar to relfux and things got much better once his tongue was clipped at 6 wks. And our latest Elliott has relfux too, he's been on meds since 2 wks... I hope things get better for you! !